Living in a stick house often allows the convenience of delaying badly needed structural maintenance and repairs. Most non-movable houses have the architectural integrity to withstand occasional maintenance delays, which gives you the ability to save up money for repairs. 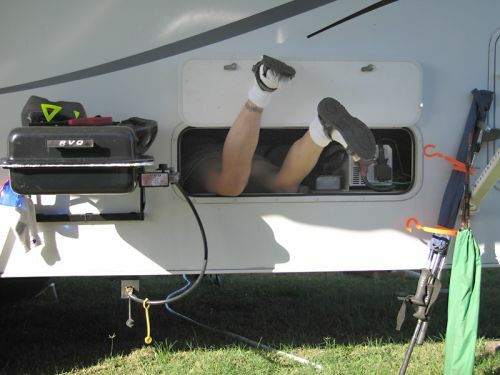 However if there’s anything we learned when we started full-time RVing, is that even the most well-made RVs aren’t as forgiving when it comes to putting off repairs. Unlike a stick house, which never moves unless you happen to live in a flood plain or in earthquake country, a recreational vehicle is constantly exposed to movement, especially if you are living in one as a full-time RVer. When your house makes sudden stops, turns or acceleration, every nut and bolt, weld, and plastic pipe is exposed to a force that can result in weakened household systems. From your plumbing to your propane lines, every critical part from your roof to your wheels should be regularly inspected. We learned this lesson the hard way less than one month on the road as full-timers. After traveling about 1,000 miles into our first trip across America, we stopped for a few days at a RV park. While hooking up, I noticed a few drops of water in the basement storage area where our water pump and fresh water holding tank resides. I unconsciously chose to ignore those drops and instead, went inside to have a beer. The next day, a neighbor knocked on our door. “Hey, uh I noticed there’s water coming out from the cabinet on the side of your RV,” he told us. Uh oh. We scurried outside into the heat and saw copious amounts of water dripping out from the underside of our rig. Jim threw open the basement door and quickly went to work while I was a coward and ran from the scene. Several minutes later he reported back with the problem: a fresh water plumbing line connection had jiggled loose and allowed water to escape. A few crescent wrench turns later, the water leak had stopped but the damage was done. The fiberglass swelled up and all we could do was hope that the arid Arizona climate would dry up the wet spots. Eventually it did but the exterior area became slightly discolored from the damage. Lesson learned: don’t ignore any potential issue without stopping to investigate. A few minutes with a flashlight and an eagle eye examination can save big dollars on major repairs later on down the road. Unfortunately even after our water leak incident it took us a few thousand miles to learn this lesson. From squeaky brakes to puddles of water under the kitchen sink, we really didn’t become more responsive to potential mechanical issues until they started to hit us in the pocketbook. Years later, we now act quickly whenever something about our RV house systems just doesn’t feel right. Instead of ignoring it and hoping it will go away, we mention the concerning issue to one another, let our blue and pink duties kick in, then we make the repair. After a job is complete, we can rest easy knowing our house on wheels won’t come apart when we hit that next big bump in the road.